Autism in Paradise: Cause for Celebration!! I had an entirely different post planned for today, but yesterday’s announcement by the U.S. Government’s Office of Personnel Management (OPM) that they will allow health insurers to cover Applied Behavior Analysis (ABA) is a landmark victory for those of us with autistic kids. 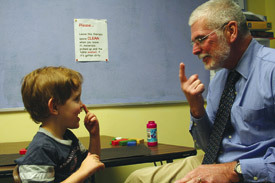 OPM’s decision that ABA is a medical therapy vice educational means “tens of thousands of families will have better access to more affordable, critical ABA treatment”, said Peter Bell, Autism Speaks Executive Vice President for Programs and Services. The federal government is the nation’s largest employer with 8 million employees, retirees and dependents, which translates into a lot of clout with insurance companies. Well, hallelujah!! It’s about time!! How insurance companies were allowed to discriminate against persons with the medical condition termed “autism” is still beyond comprehension. No one who has experienced autism first-hand would consider it an educational problem and classify it in a similar vein as dyslexia. For those of you who aren’t familiar with ABA, it’s done one-on-one, therapist to child, and if it’s done right, it could be described as targeted play. Ryan runs to his therapists when they come and enjoys his sessions, which consist of a lot of repetition designed to improve his expressive and receptive language (speaking and listening comprehension). As a federal employee OPM’s decision directly affects me, but I know this will ultimately mean more insurers will offer ABA as a benefit to remain competitive. More children will finally be able to get the care they need as therapy becomes affordable and that’s cause for celebration.